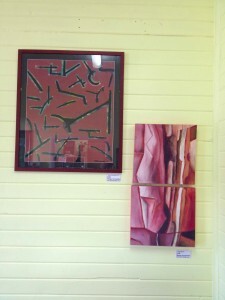 Lake Macquarie visual artist & 2013 Hunter Business Awards Finalist, Margo Humphries, is holding a solo art exhibition right now at Chocolate Hills – Tartuca Espresso Bar Bistro, Denman from 1-31 October 2013. All artworks are for sale. The exhibition compliments the cafe bistro’s best coffee, authentic Italian food, private courtyard, fresh juices, gelato and exquisite home made chocolates. Located in a strategic position midway between Newcastle and Dubbo, the Cafe bistro italian style features home made pasta, breads and focaccias, Lavazza coffee, hand made chocolates made in store, croissants, italian pastries and beautiful cakes. Ideal for breakfast, a quick snack, a relaxing lunch and afternoon tea, not to mention the monthly Italian Tapas Nights with an array of dishes from the diverse exquisite italian regions. The private courtyard is the ideal place to rest and is very suitable to family with kids. When you stop once at Tartuca – Chocolate Hills you will then make it as your favorite destination. 21c Ogilvie St, Denman. Open Mon-Fri 7.30am-4.30pm; Sat-Sun 8am-4pm. If you’re travelling on the Golden Highway in these school holidays this is a great place to visit for breakfast, lunch, coffee or cake!